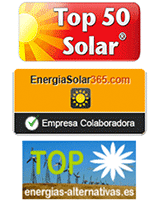 > Solar Energy>What is a solar inverter? The solar inverter is responsible for transforming the direct current from the solar panels into alternating current for household use. These devices can be connected directly to the grid of housing. When a solar panel is connected to the solar inverter, home power meter will reduce the speed or rotate counterclockwise. Solar investors use several solar panels connected in parallel to maximize the output of direct current solar system. If one of the solar panels is defective or does not get sunlight into the direct current output, it will be affected to a minimum, resulting in the opposite of when the panels are connected in series. For the installation work, the solar panels should be installed so that sunlight them directly. Once oriented, is to connect the cables to a junction box and from there to the solar inverter. Once this is done, it only remains to connect the inverter to any outlet of those in the house. Thus when the solar panels receive sunlight photovoltaic system converts solar energy into electrical energy suitable for use anywhere in the house. If after reading this you still have doubts about the details of the photovoltaic installation, contact professionals Shop-Solar.